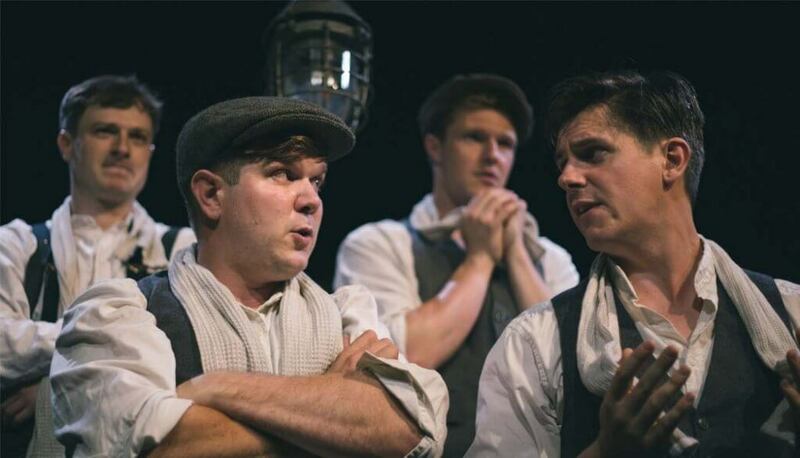 Manchester-born LAMDA graduate Kieran Knowles made his playwriting debut with Operation Crucible, a story which captured the horror of the Sheffield Blitz for those trapped in the Marples hotel. Receiving a host of rave reviews, the play toured the UK twice, enjoying a particularly successful run at The Crucible, and was partly responsible for his nomination as ‘Most Promising New Playwright’ at the Off West End Awards in 2015. Knowles’ latest offering, Chicken Soup, written alongside local writer and actor Ray Castleton, sees him revisiting South Yorkshire during two huge political events: The Miners’ Strike and Brexit. Switching between both eras, audiences will be introduced to two groups of women doing their bit for a suffering community in a 1980s soup kitchen and a 2016 food bank. Ahead of its opening at the Studio Theatre, Rachel Havard spoke to the rising playwright to delve a bit deeper into the inspiration behind it all. What motivated you to revisit Orgreave in a 2018 play? The miners’ strike was fascinating, and the social disparity that drove miners to strike in 1984 meant soup kitchens were necessary to live. Move forward to recent times, there is increasingly more people using food banks because they are living in poverty. We’re in a First World economically developed country, yet a massive number of people – more people than ever – are having to use food banks to live. Focusing on five women working in a food bank/soup kitchen takes a look at the impact on communities, and the locality involved makes it personal. Why have you chosen to cast women as the main characters this time? Casting men only in my Operation Crucible was never deliberate, and the same with 31 Hours played in London – they were all blokes too. They were just stories that interested me and men happened to be the main characters. In Chicken Soup, actually, all of the actors are female. It wasn’t a conscious decision in either play. I just like the stories, so there’s no deliberate choice. I think that’s the inspiration behind this play: being set at the time of the strike, I wanted to look at the drive of women to do something and help in some way, as they couldn’t actually strike. They were involved in all the chaos but couldn’t help in that sense. The soup kitchens and food banks allowed them to play a role, and I think the play gets across the real strength of these women rising up in difficult times. What’s it like to be a young playwright writing about an event that happened in 1984? Do you think your age gives the play a different perspective? I found the miners’ strike fascinating, but yes, being 33 I didn’t actually live through it. That said, I lived in the aftermath of it – I was actually born on the day the miners went back to work! My family doesn’t have a mining background but going to school with kids whose families did, whose fathers were miners, I felt the after-effects of the strike. Ray [Castleton, co-writer] was from a unionised miner’s family, so he’s a walking book on the subject! He’s 70-years-old and we’re a bizarre medley of seniority, but we have the same sense of humour at least. How was it working with Sheffielder Ray Castleton as co-writer? How did you decide to team up? It’s been brilliant. Ray saw Operation Crucible on an artist night, and he stuck around in the bar afterwards. I happened to have a pint with him and we got chatting; it was then I first told him about my idea of setting a play in a mining community. It was probably the most fortuitous night of my life as Rob Hastie, Artistic Director of Sheffield Theatres, walked in when we were speaking about it and said he’d commission the show! Unfortunately, he left without giving me his number, so I scoured Twitter and the rest of the internet until I found it! Back in November the play was just a suggestion over a pint – by December it was commissioned. You’re originally from Manchester, so what has caused the interest in writing plays based in Sheffield and South Yorkshire? Operation Crucible was a historical event that no-one really knew about, and I wanted to recreate what it might have been like, to tell people about the horror. That opportunity led to this opportunity, all after meeting Ray over a pint. I love Sheffield and definitely have a soft spot for it. I have family around here so I come back fairly often, and it’s just a great place with a fascinating history. Is Chicken Soup trying to make a political statement through looking at the hardship caused to communities following the Miners’ Strike and the Brexit vote? I’m not making any claim about it. The play is split between 1984 and 2016, 32 years apart, and the communities are so different. In 1984 mining communities were uniting to re-establish their identity; 32 years later and communities are trying to find an identity amidst split political identities. The play isn’t meant to show political opinions, because that’s a divisive topic – if you go in too hard on either side you’ll alienate people. Of course, Brexit is massive in shaping the next two decades – but in Rotherham over half voted leave, and ultimately more people wanted leave than remain. Chicken Soup is about bringing a community together onstage, not necessarily the politics.